We now have Molded Seat Covers that provide a next-level custom fit that goes above and beyond standard seat covers. They help transform the shape of your seat all while providing no seems or stitches. 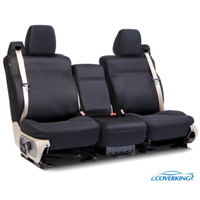 If you don’t see any available for your vehicle, then Coverking’s custom-fit premium seat covers are available in a variety of colors and materials, that fit snugly, provide added comfort, and protect your upholstery from regular wear and tear!